Autumn is one of my favourite times of the year. As the green leaves of summer change to golden yellows reds and browns and fall from the trees, the dark nights start to draw in, and the weather gets colder, inching closer every day to my very favourite season winter!. It is only since I have had kids that I have come to appreciate the seasons more. Autumn is a great season for small children: harvest festival, family birthdays, bonfire night, my birthday, generally a short break away and of course, the excitement and lead up to Christmas which generally kicks in at the start of November in our house. Autumn is also a fantastic season for food. There is a huge array of delicious dishes to prepare as all of the nights draw in. As the weather gets colder, my Autumn menu will typically feature casseroles, pies, baked dishes, soups and hearty warm foods. So for the first of many autumn dishes, I am featuring Butternut Squash soup. Butternut squash is a sweet vegetable with a tough exterior and orange flesh. Generally in season between September & November, it is really versatile to cook with and features lots of vitamins A &C and is also very low in fat. Butternut Squash also keeps for quite a while. In a cool (not refrigerated place, they can keep for three months or more. At room temperature, or in the fridge, they will deteriorate more quickly, but typically keep for at least a couple of weeks. I am ashamed to admit that I never really came across butternut squash until I started weaning my eldest and found out that it was a great first food to puree, but since discovering it, I have started to cook with it more and more, including it in pasta dishes and baked on its own. One of my favourite things to do with butternut squash though is to make soup. I have included the recipe below, but you could also vary the soup by adding a teaspoon of Nutmeg and or Cinnamon. 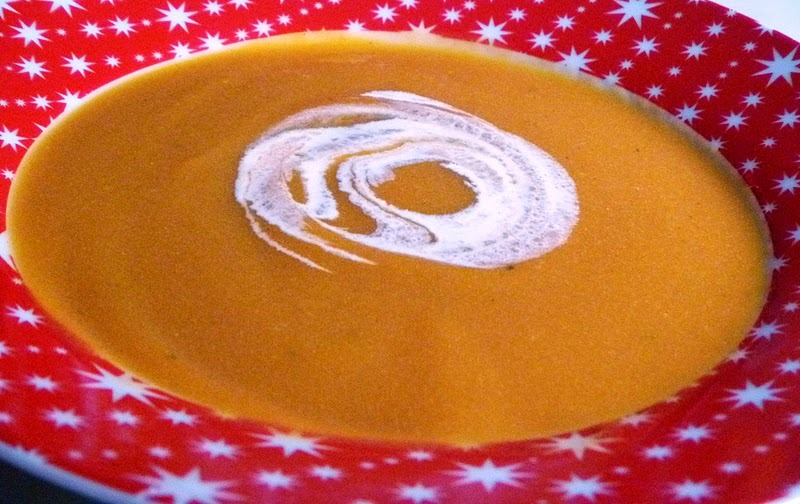 You could also just add half the butternut squash and add sweet potato or carrot to the soup also. What do you do with butternut squash? Saute the onion in a frying pan for 8 minutes over a medium heat and stir intermittently until transparent. Add the garlic and stir for a further minute or two. Add the butternut squash cubes and turmeric to the frying pan and saute for a further 5 minutes. Add the stock and simmer for 25 to 30 minutes or until the squash is tender. Allow to cool and then puree in the blender. I typically puree one half, and then the other. Reheat to serve, or freeze for a later date. I love butternut squash, and it is a great soup choice too! Also, thought I'd let you know that I posted up a link to your website on my latest post on the Tech n Taste event! I love adding ginger, garlic and a hint of honey (or maple syrup) to this soup. Mmmm! Or - halve the squash lengthwise, scoop out the seeds, roast with a bit of chilli oil, then 10 mins before the end fill the hole with either Camembert or soft goats cheese, and bake until melty and yummy! Serve with curly kale for a great healthy meal! This is one of our Autumn/Winter staples. It's so easy to make. We add chilli for the warming effect! Thanks for entering this into Simple and in Season! A lovely seasonal favourite. A round-up should follow today. Butternut Squash... delicious! 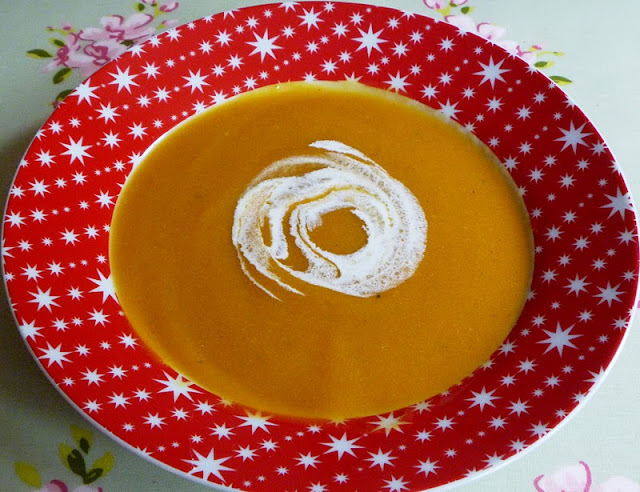 Do you fancy entering one of your veggie soups to our competition? We're on the hunt for Britain's very best vegetarian soup to become our soup of the month this September - interested? 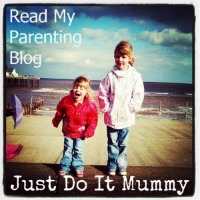 Here's the link you need: http://bit.ly/zlQxA0, please get in touch if you have any questions! Thanks - I will take a look!